The first race of Morning Grind’s second series was held on the “London Loop with Box Hill Finish” route. A category raced 2.5 laps while B, C, and D riders only had to suffer through 1.5 laps. The Morning Grind Fondo kicked off the second series with one of the toughest courses imaginable. The starting pen was more full than it had ever been in series #1, and the caliber of riders also ticked up several notches—some of Zwift’s strongest showed up to throw down. The bunch was very calm on the flats knowing what was ahead, and thankfully the race was boring until we hit Box Hill. As we turned right into the climb, the group split immediately, with half of the riders falling off the lead bunch. Matt Gardiner took the KOM in 5:50 with the remaining in the lead group crossing the line under 6 minutes. The group stayed together through the descent and flats until the second ascent of Box Hill. Jose Wence attacked at the base, getting a 0:03 gap before DRAFT closed the gap and controlled the pace. Shortly after, Lionel Vujasin attacked with 2 minutes left in the ascent, forcing riders to accelerate to not let him get away. In all, only 4-5 riders were dropped off the group as we hit the descent. On the final climb to the finish, accelerations wreaked havoc on the bunch as riders fought for position—Sam Brännlund, Huang Xiao Yu, and Yunfei Wu attacked at the painted road and found a gap behind them before ramping up the sprint. The riders carried their effort through the finish going 1-2-3. Series 2, race 1 was a massive success with a record 75 B riders in the pen! With individual categories having separate starts, it seemed to be a little bit less of a chaotic start at a slightly milder pace. But by the time we hit the first rollers, all hell was breaking loose and those that were in for the win were showing their teeth. At about the 8-minute mark, a blistering pace was set up Box Hill that had us revving over 4 watts/kilo average. The hill shattered the peloton into a front group and a chasing pack. Activity on Discord was lively and riders were marked and breaks were chased down. Team Type 1’s Paul Buckland made his intentions clear that he wanted the series 2 title and the race win. As the group hit the upper ramps of Box Hill on lap 2, a group of 5 strong riders including 2 from Team DIRT, Buckland and a few privateers broke off the front with a pace the others could not match. With a quarter mile to go, the sprint was unleashed with the win for Buckland looking promising. Unfortunately for him, DIRT underdog Shawn McAfee pulled a hat trick and took the win with what was almost a premature celebration. The hilltop banner, unbeknownst to most riders was about 100 ft after of the finish line. Shawn can be seen throwing his hands in the air on his live stream just under the banner and had just enough speed to coast over the finish line in the front position. Well played, Shawn! The second iteration of the series kicked off with a bang as the top five D finishers averaged 2.4w/kg and above. Having separate category starts and a shorter course brought more D rider participation than in the past. The start was very strong but maintainable for the riders with a small initial split occurring. The remaining riders worked well in a group before being gutted on the first climb. The first series winner, Len Baird, lost the wheel of the main group at this point. As the group strung out, one could see above category riders pulling away. This became more pronounced as the strongest Ds hit Box Hill holding 2.6w/kg while others were well above 3.0w/kg. A small lead group continued to push a steady pace leading to a split that seemed insurmountable. The riders crested and made the push back towards the city with the subway stairs being the remaining challenge. Jamie Jackson [DIRT] (first MGF series runner up) went all out on the stairs to reduce the gap to a couple riders from the lead group. He and another triathlete, Jason Zilles [DIRT], raced each other to the line with Jackson taking the spot on the sprint. With four riders over w/kg that put Jamie Jackson [DIRT] into first place for the race and series. Newcomer Wesley Stocker [DIRT] was second with Mike Ewing finishing in third. The Morning Grind is a collaborative 12-week race series between Team DRAFT and Team DIRT where overall standings are tracked and prizes will be giving to category winners at the end of the series based on cumulative standings. 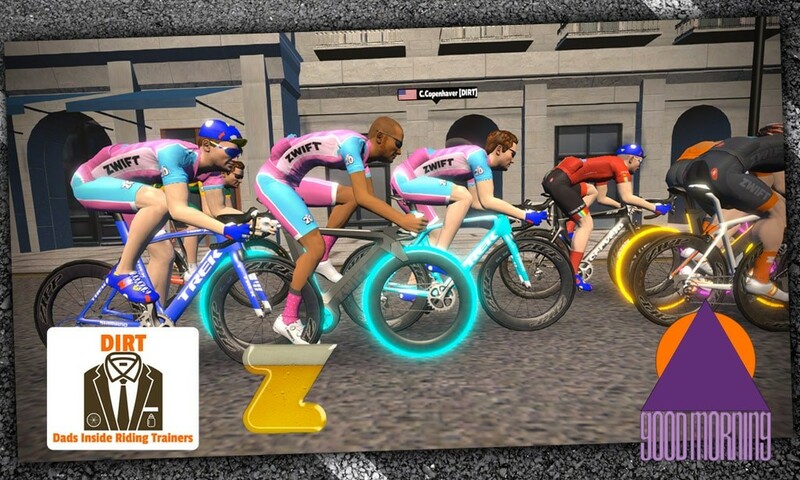 DRAFT is a virtual bike racing team that competes with the global community on Zwift promoting sportsmanship, unity, and integrity. DIRT (Dads Inside Riding Trainers) is a group of dads making time for ourselves for fitness, fun, and friendship on the Zwift platform by hosting daily rides and weekly races.